Hi all! Thanks Betty for setting up this Knitalong. I hope I can...well, keep knitting along! I need to make a decision - I started the Heatwave tank from Southwest Trading Company Bamboo yarn, which my LYS was clearing out. But I hadn't gotten far before the summer IK featured the Lotus Blossom tank, which looks like way more fun. I'll probably just start the Lotus Blossom tank and see if the lace shows up well enough, then make a decision. Otherwise, I like the colour and feel of the yarn. It's a bit crisp, but I'm told it will soften up when washed. 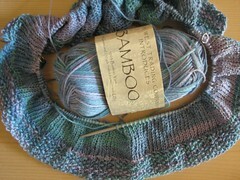 I've knitted with Bamboo before. It does soften up after washing. You probably had to buy a few skeins of the Bamboo to do the Heatwave tank, so I would probably just started knitting Lotus Blossom in one of the other skeins. So yeah - basically what you said. I approve! I have gone with the Sahara variegated colourway - I couldn't decide which colour to get and this mixture looked interesting. I ordered it yesterday from the store I mentioned in my previous post. Hope it arrives soon.